C8 Water Contamination Lawsuits Filed By Ohio and West Virginia Residents Contend Development of Thyroid Disease, Testicular Cancer, And Other Health Conditions After Drinking Water Contaminated By C8 Released From DuPont’s Washington Works Plant near Parkersburg, West Virginia. The firm is representing numerous plaintiffs in the C8 multidistrict litigation pending in the U.S. District Court, Southern District of Ohio. Attorney Richard W. Schulte, a founding partner with Wright & Schulte LLC, is serving on the plaintiff’s steering committee, after he was appointed by U.S. District Judge Edmund A. Sargus, Jr. Judge Sargus is presiding over the C8 litigation along with District Court Magistrate Judge Elizabeth Preston Deavers. Wright &amp;amp;amp;amp; Schulte LLC continues to offer free C8 lawsuit consultations to individuals who developed a serious illness and fall under the C8 Science Panel Guidelines. For more information on filing a C8 lawsuit or to schedule a free legal consultation with a C8 attorney from Wright & Schulte LLC, call 1-800-399-0795 or visit yourlegalhelp.com. About Wright &amp;amp;amp; Schulte LLC Wright & Schulte LLC, an experienced personal injury firm, is dedicated to the belief that America’s legal system should work for the people. Every day, the attorneys of Wright Schulte LLC stand up for the rights of people who have been injured or wronged, and fight tirelessly to ensure that even the world’s most powerful corporations take responsibility for their actions. If you’re looking for a law firm that will guarantee the aggressive and personal representation you deserve, please do not hesitate to contact Wright &amp;amp;amp;amp; Schulte LLC today. 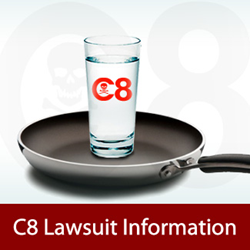 Free DuPont C8 lawsuit case evaluations are available through yourlegalhelp.com, or call 1-888-399-0795.